Definition at line 26 of file NVPTXTargetMachine.h. Definition at line 106 of file NVPTXTargetMachine.cpp. 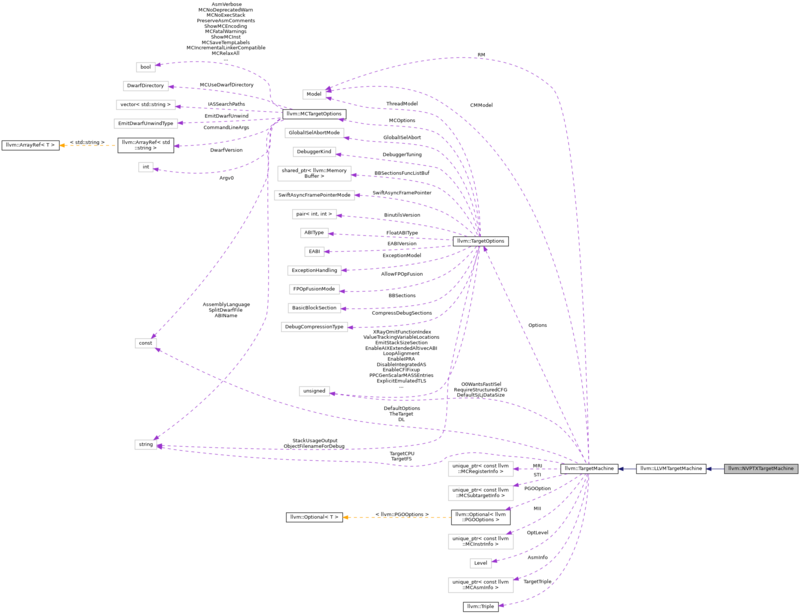 References llvm::NVPTX::CUDA, DisableRequireStructuredCFG, llvm::Triple::getOS(), llvm::LLVMTargetMachine::initAsmInfo(), llvm::NVPTX::NVCL, llvm::Triple::NVCL, llvm::TargetMachine::setRequiresStructuredCFG(), and ~NVPTXTargetMachine(). addPassesToEmitMC - Add passes to the specified pass manager to get machine code emitted with the MCJIT. This method returns true if machine code is not supported. It fills the MCContext Ctx pointer which can be used to build custom MCStreamer. Definition at line 58 of file NVPTXTargetMachine.h. Definition at line 198 of file NVPTXTargetMachine.cpp. References llvm::legacy::PassManagerBase::add(), llvm::PassManagerBuilder::addExtension(), llvm::createNVVMIntrRangePass(), llvm::createNVVMReflectPass(), and llvm::PassManagerBuilder::EP_EarlyAsPossible. Definition at line 194 of file NVPTXTargetMachine.cpp. Definition at line 50 of file NVPTXTargetMachine.h. 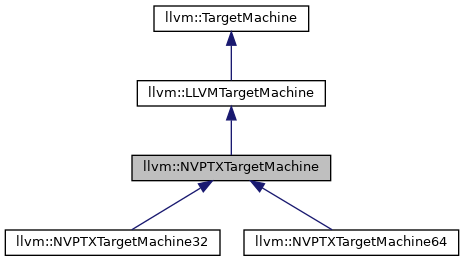 Referenced by llvm::NVPTXAsmPrinter::doInitialization(), and llvm::NVPTXSubtarget::hasImageHandles(). Definition at line 51 of file NVPTXTargetMachine.h. Referenced by llvm::NVPTXTargetLowering::LowerCall(), and VisitGlobalVariableForEmission(). Definition at line 62 of file NVPTXTargetMachine.h. References adjustPassManager(), F(), and getTargetTransformInfo(). Definition at line 44 of file NVPTXTargetMachine.h. Definition at line 47 of file NVPTXTargetMachine.h. Definition at line 208 of file NVPTXTargetMachine.cpp. References llvm::TargetPassConfig::addIRPasses(), llvm::CodeGenOpt::Aggressive, llvm::createAllocaHoisting(), llvm::createEarlyCSEPass(), llvm::createGenericToNVVMPass(), llvm::createGVNPass(), llvm::createInferAddressSpacesPass(), llvm::createLoadStoreVectorizerPass(), llvm::createLowerAggrCopies(), llvm::createNaryReassociatePass(), llvm::createNVPTXAssignValidGlobalNamesPass(), llvm::createNVPTXImageOptimizerPass(), llvm::createNVPTXISelDag(), llvm::createNVPTXLowerAllocaPass(), llvm::createNVPTXLowerArgsPass(), llvm::createNVPTXPeephole(), llvm::createNVPTXPrologEpilogPass(), llvm::createNVPTXProxyRegErasurePass(), llvm::createNVPTXReplaceImageHandlesPass(), llvm::createNVVMReflectPass(), llvm::createSeparateConstOffsetFromGEPPass(), llvm::createSpeculativeExecutionPass(), llvm::createSROAPass(), llvm::createStraightLineStrengthReducePass(), llvm::DeadMachineInstructionElimID, DisableLoadStoreVectorizer, llvm::EarlyMachineLICMID, llvm::EarlyTailDuplicateID, llvm::FuncletLayoutID, llvm::TargetMachine::getOptLevel(), llvm::NVPTXSubtarget::getSmVersion(), getSubtargetImpl(), llvm::NVPTXSubtarget::hasImageHandles(), llvm::LiveDebugValuesID, llvm::LiveVariablesID, llvm::LocalStackSlotAllocationID, llvm::MachineCopyPropagationID, llvm::MachineCSEID, llvm::MachineLoopInfoID, llvm::MachineSchedulerID, llvm::MachineSinkingID, llvm::CodeGenOpt::None, llvm::OptimizePHIsID, llvm::PatchableFunctionID, llvm::PeepholeOptimizerID, llvm::PHIEliminationID, llvm::PostRAMachineSinkingID, llvm::PostRASchedulerID, llvm::ProcessImplicitDefsID, llvm::PrologEpilogCodeInserterID, llvm::RegisterCoalescerID, llvm::ShrinkWrapID, llvm::ARM_MB::ST, llvm::StackColoringID, llvm::StackMapLivenessID, llvm::StackSlotColoringID, llvm::TailDuplicateID, and llvm::TwoAddressInstructionPassID. Definition at line 48 of file NVPTXTargetMachine.h. Referenced by canLowerToLDG(), llvm::NVPTXAsmPrinter::doInitialization(), and pickOpcodeForVT(). This is a stopgap measure to fix targets one by one. We will remove this at some point and always enable the verifier when EXPENSIVE_CHECKS is enabled. Definition at line 70 of file NVPTXTargetMachine.h. Definition at line 49 of file NVPTXTargetMachine.h.